Damon Albarn, Paul Simonon, Tony Allen and Simon Tong talk to John Wilson about the album that gave this modern day 'super-group' its name - The Good, The Bad & The Queen. John Wilson returns with another run of the series in which he talks to leading performers and songwriters about the album that made them or changed them. Recorded in front of a live audience at the BBC's iconic Maida Vale Studios. Each edition includes two episodes, with John initially quizzing the artist about the album in question, and then, in the B-side, the audience puts the questions. Both editions feature exclusive live performances. A-side: The Good, The Bad & The Queen. 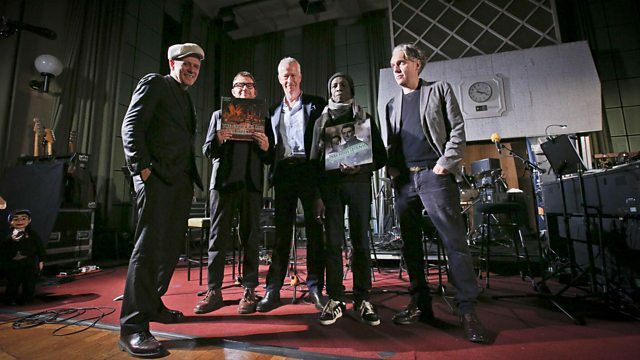 Modern day super-group, DAMON ALBARN, PAUL SIMONON, TONY ALLEN and SIMON TONG talk to John Wilson about their acclaimed debut album "The Good, The Bad & The Queen." Released in 2007, the album brought together Blur’s front-man, the bassist from the Clash, the Afrobeat pioneer who was also Fela Kuti’s drummer, and former guitarist from the Verve who co-created the Magnetic North. Described by Damon Albarn as “a song cycle that's also a mystery play about London”, the record was voted the Best Album of 2007 by the Observer Music Magazine and it includes the singles Herculean, Kingdom of Doom and Green Fields. Although Simon Tong and Paul Simonon appeared on the next Gorillaz album and Tony Allen collaborated with Damon Albarn on Rocket Juice & The Moon, the band have not released any more material… until now – their long-overdue follow-up Merrie Land was released in November.